Andy Warhol and his generation of pop artists has ever since the early 1960’ies been a great inspiration to the art world. Many queer artists have made pop art and made works of art relating to or commenting on the masters of pop art. Remember for example Deborah Kass’ works Double Red Barbra (The Jewish Jackie Series, 1992) and Single Red Yentl (My Elvis, 1993). Now the Femina Potens Gallery in California presents a new generation of female artists who works with pop art and surrealism and they invite you to the opening reception for ‘Pop Pop! 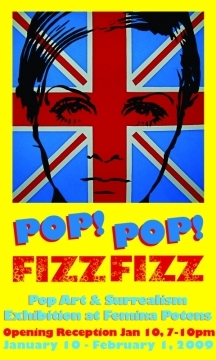 Fizz Fizz!’ on January 10, 2009, at 7pm – 10pm. Femina Potens hosts five artists Erika Meriaux, Jenny Wehrt, Katie Gray, Audrey Welch, and Hiroko Sakai, who explore the people and objects that are ‘popular’ to them. The artists pay a contemporary homage to what they cherish in the vein of Andy Warhol, Jasper Johns, Jeff Koons, and other artists. Show runs January 10 – February 1, 2009.